The 11 homes in Somerset Cove offer two unique features: a generous 2,757 square-foot layout and deeded boat docks. 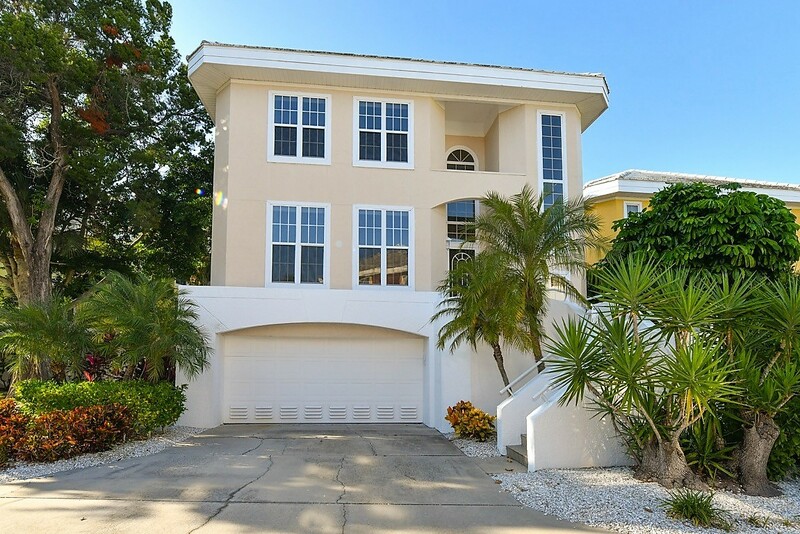 In addition, the gated boating enclave on the north end of the Key has lush landscaping and heated pool overlooking Coconut Bayou, a natural bayou. In addition, the community is only a short two-block stroll to quiet Shell Beach. The homes are spacious, with living space spread out on three floors, as well as a three-car garage and additional storage. Of the 11 homes in Somerset, five are single-family homes and six are duplex townhomes. “These homes have approximately 2,800 square feet of living space with an additional 1,200 feet of ground floor space,” Realtor Bob Ruiz told Siesta Sand. “The living rooms are two-story, open and airy with an abundance of windows.” Most units also have private elevators (or the space for an elevator) to access all three levels, adds Ruiz, who has a single-family home listed on the market for $849,000. All of the residences in this maintenance-free community have deeded boat docks, with some already equipped with lifts. The community offers excellent boating access, says John Garrity, who has owned a home with his wife in Somerset Cove since 2008. Docks on the bayou allow unobstructed deepwater access to picturesque Roberts Bay and onward to the Intracoastal Waterway and the Gulf of Mexico. Because the boat docks are on a natural water body, there are none of the issues associated with waiting for tides, as there can be with docks on canals. “Even with low winter tides, there is no problem getting in and out of the lifts,” Garrity told Siesta Sand. The homes at Somerset — built in Key West modern style — feature “oversized garages” and an expansive living area, notes Bob Ruiz, Realtor with Key Solutions Real Estate. “What makes them unique is that the community is maintenance free, gated and each home comes with a boat dock, many with lifts,” said Ruiz. Other pluses are the beautiful community pool, short walk to Shell Beach, and easy access off the island to downtown Sarasota, notes Ruiz. “The pool is quite large, private, and set on the bayou marina,” Ruiz says. “Recently refurnished, the pool furniture is beautiful — very resort-like. Somerset is divided between full-time and seasonal residents. While some owners are not boaters, Garrity notes, everyone is able to enjoy the water — including the short stroll across Higel Avenue to Shell Beach at Public Access 1. 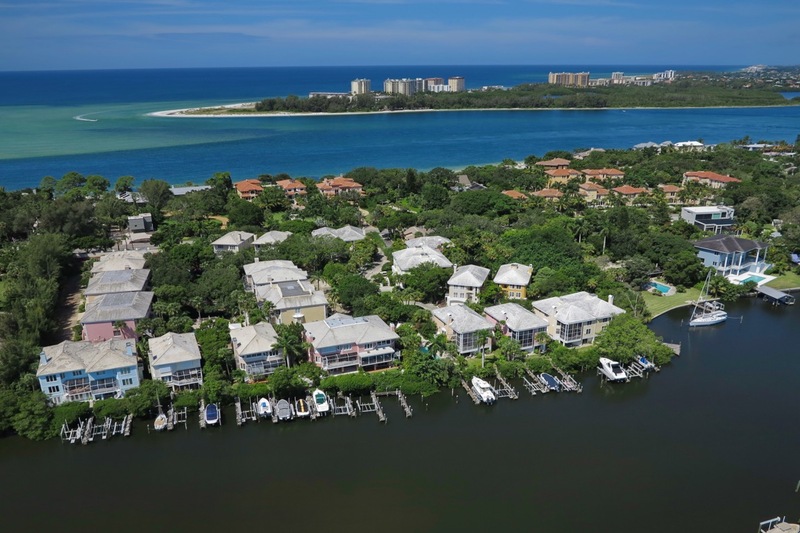 The community is undervalued on a square footage basis for many reasons, not least of all because it affords boat docks to all owners with quick access to the intracoastal, Sarasota Bay, and the Gulf, adds Ruiz. There is currently one unit listed on the market, and have been four recent sales. A single-family home is listed for $849,000, a recently reduced price. At 2,758 square feet, the asking price comes out to $308 a square foot. The home, listed by Ruiz, includes direct access to the bay, intracoastal waterway and Gulf from a deeded 40 foot boat slip with electric and water. Inside, high-end finishes include private elevator, coastal wood flooring, crown molding, wood cabinets, stainless appliances, and more. 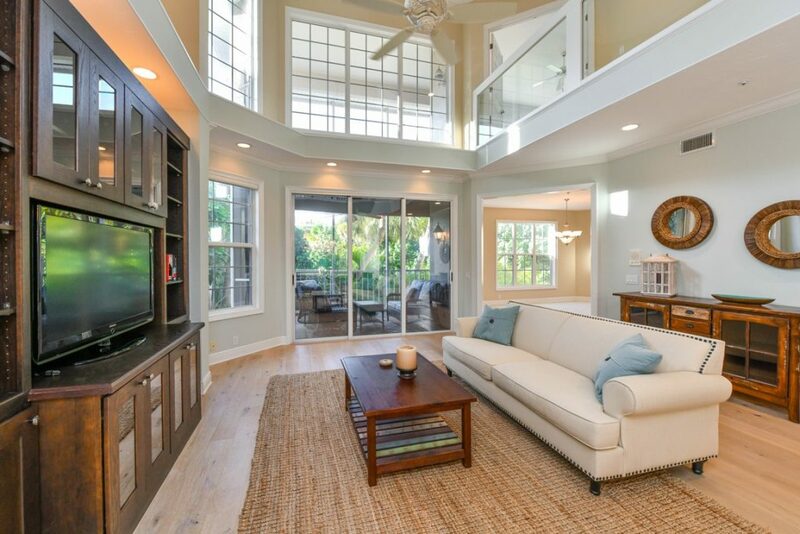 The large living room has custom built-in features and opens to a screened lanai. 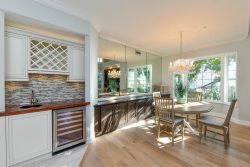 The home features a gourmet kitchen with wood cabinets and stainless appliances, with an adjoining sitting room/breakfast nook that is the ideal spot for relaxing and conversing before or after meals. The spacious dining area with wet bar and wine refrigerator opens to the living room for easy entertaining. There is a large master suite with abundant closest and bath, two guest en-suites and a spacious loft area for additional sleeping/den/or office space. The downstairs fitness area and additional space for office, or storage, open to the outdoor patio with luscious garden-like grounds just beyond. An oversized three-car garage completes this home. A recently-renovated townhome sold for $840,000, or $305 a square foot, in September, 2017. 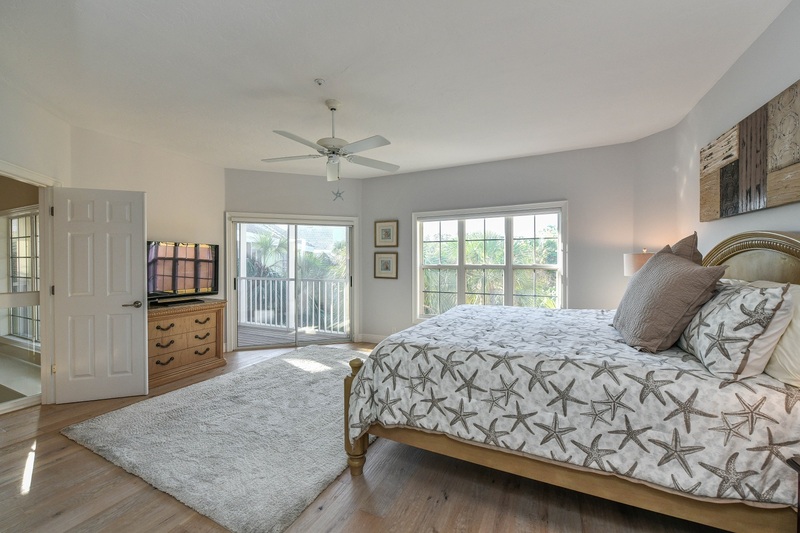 According to the MLS listing, the townhome was recently renovated with new private elevator, high-end lighting, coastal wood-look tile flooring, new baths, paint, and custom stairway. The large living room has a fireplace and screened lanai overlooking garden-like grounds. 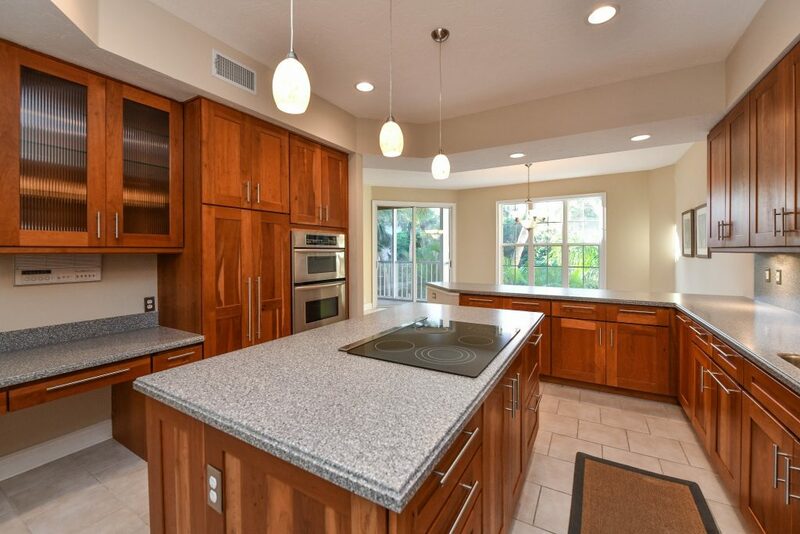 The home also has a gourmet kitchen with wood cabinets. An interior meticulously-maintained townhome with deeded access to a dock with a 13,500-pound lift sold for $ 675,000 in February, 2017. The sale worked out to $245 a square foot. Some unique features include a hurricane rated garage door, newer A.C. system, and wine cooler. A single-family home sold for $720,000 in December, 2016. The large kitchen with beautiful wood cabinets, stainless appliances, and granite countertops accommodates a family sized table and chairs. The open floor plan accommodates a second dining space adjacent to the living room. A sizable bedroom with en-suite bath and a hall laundry room complete the first floor living space. The oversized garage and huge finished lower level bonus space complete this home.